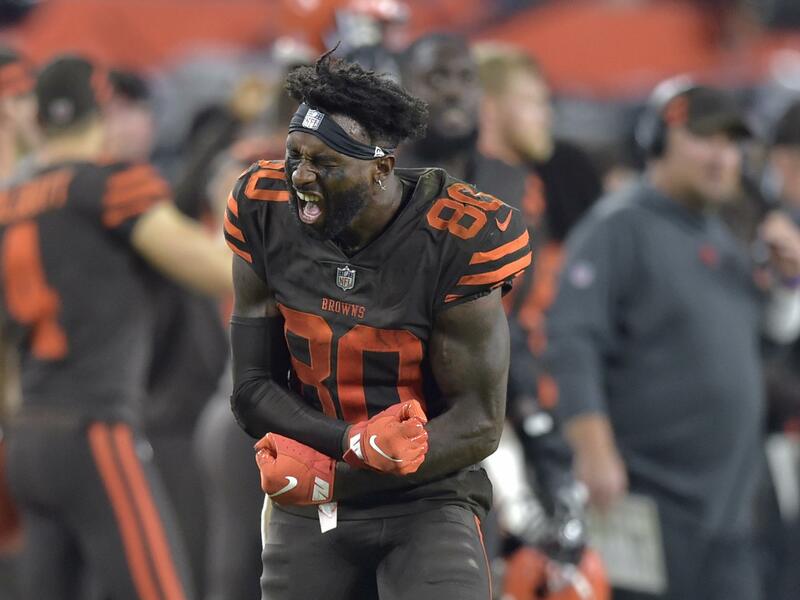 Cleveland Browns wide receiver Jarvis Landry celebrates as the Browns seal their first win since December 2016. On Thursday night, Landry had more than 100 yards receiving — and he threw a two-point conversion pass to quarterback Baker Mayfield. The Cleveland Browns made a rare visit to the win column Thursday night, ending a streak of frustration and futility by beating another NFL team for the first time since Christmas Eve 2016. The win set off celebrations – including a promotion campaign that had offered free beer if the team won a game in 2018. The Browns beat the New York Jets, 21-17, bringing their record to .500. Three games into the 2018 season, the Browns are 1-1, with one tie. "We WON!!!" the Cleveland Police Department tweeted last night, before adding, "Wait....Oh God. The free beer thing...Ok Cleveland. Stay calm. GO BROWNS!!!" The free beer came in the form of Bud Light. Anheuser-Busch had promised to give Browns fans a cold beer if their team could win a game, installing orange "victory fridges" refrigerators in bars in Cleveland and surrounding areas that were synced to unlock in the event of a Browns win. Others celebrating the win included Ohio native LeBron James, who tweeted, "Congratulations @Browns!!!!!" The win was accompanied by another unusual sight, as a fan decked out in orange and white managed to catch a opossum at Cleveland's FirstEnergy Stadium. The man gingerly — but confidently, we must add — held the opossum by its tail as a stadium worker came to help, and fans cheered as the animal was lowered into a cardboard box. The team later said of the game's unsolicited mascot, "Shout out to this guy ... #RallyPossum." A lot had happened in the 635 days leading up to last night — but a Cleveland win was not one of them. Along the way, there were agonizing near-misses, including a mind-numbing 12-9 overtime loss at home to the Tennessee Titans, in which Browns' stalwart left tackle Joe Thomas suffered an injury that effectively ended his NFL career. "This crowd deserved to see that first win at home," said rookie quarterback Baker Mayfield, who entered the game after starter Tyrod Taylor was injured late in the second quarter. "That's the thing I'm most proud of is we put it together for the fans at home." Mayfield hadn't practiced with the No. 1 starters this week, and he came into the game with his team down by two touchdowns. When asked how he was able to perform at a high level – completing 17 of 23 passes – he said the daunting circumstances were nothing new. "As corny as it sounds, it's kind of how my whole life's gone," Mayfield said. "I've had a backup role and had to fight through some things and always had to be mentally ready, and ready to go." Led by Mayfield, the Browns got a field goal just before halftime and outscored the Jets in the second half, 18-3. The crowd had roared as he entered the game, a No. 1 draft pick and Heisman Trophy winner whom the fans have seen as the latest hope for a winning team. Mayfield's highlight reel for the game included catching a pass on a two-point conversion. In that play, the quarterback lined up outside the pocket as the Browns ran a reverse. Mayfield ran wide to the end zone, turned — and gathered in a pass from Jarvis Landry. For now, Browns fans can walk around being proud of this win, which its defense sealed with a pair of interceptions in the game's closing minutes. Those plays ended the Jets' chances and set off pandemonium in and outside of the stadium. "I felt the energy, it was an unbelievable feeling," Mayfield said of the fans' reactions during a game that gave them, finally, something to cheer about. NFL fans are notorious for dreaming big early in the season — a two-game streak in either direction can spark talk of either going to the Super Bowl or of firing an entire team. After Thursday's win, Mayfield said that if the Browns can emerge from the first four games with a winning record and stay focused, "you can come out and you can have a home playoff game." He later clarified, "That's the goal." For Browns fans who have sustained their passion despite not seeing their team win their division in almost 30 years, a home playoff game would likely be even more welcome than a free beer.